Rabbi Eliot Feldman (efeldman18@gmail.com) is a former congregational rabbi, head of school and veteran Jewish educator who now creates and provides professional development experiences for education and nonprofit organizations. 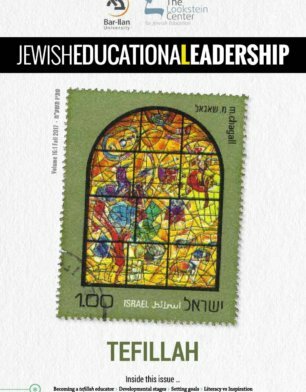 Eliot Feldman shares a rubric for assessing tefillah. In the 2011 movie Moneyball, Brad Pitt in the role of general manager of the 2002 Oakland Athletic baseball team shows how it is possible to build a team of undervalued talent by using a systematic data approach towards scouting and analyzing players. In baseball this empirical analysis of data is called Sabermetrics and today gathering and analyzing statistics drives a large sector of the economy. One area that might have been seen as exempt from such scrutiny is the space of spirituality, specifically prayer, which as Jonathan Sacks (2009, p. xvii) notes, “is the language of the soul in conversation with G-d.” Most would recognize tefillah as sacred and private in space and time, an experience which is not conducive toward producing quantified data – in other words, outside the boundary of statistical data. For most school subjects and experiences there is an understanding of what excellence looks like. In language arts, it could be the organization of an essay, the proper use of grammar, or the critical analysis of a text. For math the performance of understanding could be the application of a formula, or the solution to word problems. But what about tefillah? 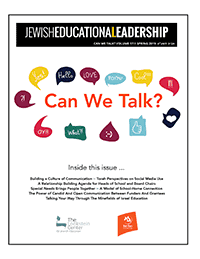 Indeed, some schools have chosen to exclude tefillah from the formal curriculum and grading. For those who are tasked to created structured tefillah, the challenge is how to embed a passion for the daily routine of prayer. There is a need to create a rubric for assessing tefillah that goes beyond the externals, can be applied to different settings across denominational lines, and which does not invade the personal space of the individual whose spirituality cannot be subject to outside evaluation. Enter Bloom’s Taxonomy, a way of categorizing educational goals. In 1956, Benjamin Bloom with collaborators Max Englehart, Edward Furst, Walter Hill, and David Krathwohl published a framework for categorizing educational goals. Familiarly known as Bloom’s Taxonomy, this framework has been useful for generations of K-12 teachers and college instructors in their teaching. The framework elaborated by Bloom and his collaborators divides the way people learn into domains, one of which is the cognitive domain which emphasizes intellectual outcomes and consists of categories that are arranged progressively from the lowest level of thinking, simple recall to the highest, creating new ideas Anderson & Krathwohl, 2001). Applying these to the elements of prayer can provide direction and focus toward achieving a spiritual experience during the time set aside for prayer. See the Tefillah Project Evaluation Rubric , which elaborates on the brief description below of the tefillah rubric. Remembering involves exhibiting memory of previously learned material by recalling facts, terms, basic concepts and answers. Into this group could be listing the names and times for prayer, the different postures of prayer, references to the Creator and examples of how prayer reminds us that there is a Master of the Universe. Understanding involves demonstrating understanding of facts and ideas by organizing, comparing, translating, interpreting, giving descriptions, and stating the main ideas. Included in this area is classifying prayer as praise, request, thanks, comparing similarities and contrasting differences in prayer services and summarizing the theme of selected prayers. Analyzing involves examining and breaking information into component parts, determining how the parts relate to one another, identifying motives or causes, and making inferences and find evidence to support generalizations. Its characteristics include analysis of elements, relationships and organization. In this category students would focus on relating traditional liturgical music (called nusah tefillah) to tefillah motif, distinguishing themes of weekday and holiday prayers and connecting postures of tefillah to mode and mood of specific prayer. Evaluating is presenting and defending opinions by making judgements about information, validity of ideas or quality of work based on a set of criteria. For the tefillah experience this would include measuring the message of prayer against personal beliefs, prioritizing the messages of tefillah to harmonize with personal feelings and to supporting personal belief system with prayer text. Creating is compiling information together in a different way by combining elements in a new pattern or proposing alternative solutions. At this stage students should be able to construct personal prayer, adapt music to create prayer mood and express personal thoughts using language of prayer. The root of the Hebrew word for prayer, tefillah is p-l-l, meaning “to judge.” When referring to the act of praying, lehitpallel is in the reflexive tense, meaning “to judge oneself.” Having a set of elements which can be a focus for growth in the prayer experience also allows the individual to a have scale by which to measure themselves, and where necessary for evaluation. Properly gathered data can be a powerful tool in achieving a desired goal. Moreover, the Talmud (Ta’anit 2a) describes prayer as the work which takes place in the heart. Daily prayer requires work. Having a structure can be of great assistance in meeting this challenge. Anderson, L. W. and Krathwohl, D. R. (2001). A Taxonomy for Learning, Teaching and Assessing, Abridged Edition. Boston, MA: Allyn and Bacon. Sacks, J. (2009). Understanding Jewish Prayer, introduction to Koren Siddur. Jerusalem: Koren.